But so many other times the dirtiness is completely unplanned. Just the other day my 4 year old somehow managed to get his shirt completely covered in dirt while we were walking 8 houses down on the sidewalk to the bus stop. My daughter decided the other day while in the parking lot she needed to rub a car’s tire with her hand and then smear the black all over her face. It all happens in the blink of an eye. Skin is fairly easy to clean but dirt and grass stains can be a nightmare to remove from clothes. As the official washer and dryer of Major League Baseball, Maytag laundry knows all about having to get tough stains out of clothes. 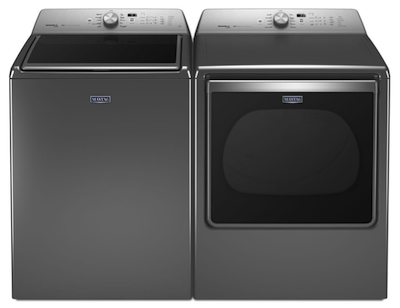 Maytag’s newest Top Load Washer & Dryer pair is better built because they are designed, engineered and assembled in America and have the power to clean big league stains. Maytag and MLB are teaming up to bring you the Filthiest Plays of the Week contest. Starting August 3 and running for 6 weeks, they are asking any ball players at any level to upload photos or videos of their sliding, diving or just “filthy plays” using “#MyFilthiestPlay” on Twitter or Instagram, for weekly prizes like a Maytag Top Load Washer and Dryer pair, and the opportunity of a lifetime – a grand prize trip to the World Series. My young kids haven’t played organized baseball yet so they haven’t had a chance to dive into home plate yet but they sure know how to dive into a plate of cake. When they were little it was so much fun to let them eat their birthday cake with their hands and make a huge mess. So what are you waiting for? Get those cameras out and get dirty! Your kid’s next dirty play could earn you a trip to the World Series. No one eats like a small child! Both hands, face, feet sometimes. You childrens pictures are so cute! Yes little kids end up with food everywhere! I’m often amazed at how they can get food all over themselves. It’s crazy how dirty they get. It’s a talent we’re all born with. What a cool giveaway for maytag and the MLB. We’re gonna go get dirty!!!!! !